BRIDGETOWN, Barbados – Samuel Badree celebrated his birthday with a career-best bowling performance as West Indies beat England in the first T20 International at Kensington Oval. The experienced leg-spinner, who turned 33 on Sunday, ended with the impressive figures of 4-0-17-3 as the Windies won by 27 runs infront a full house of 13,500 spectators. 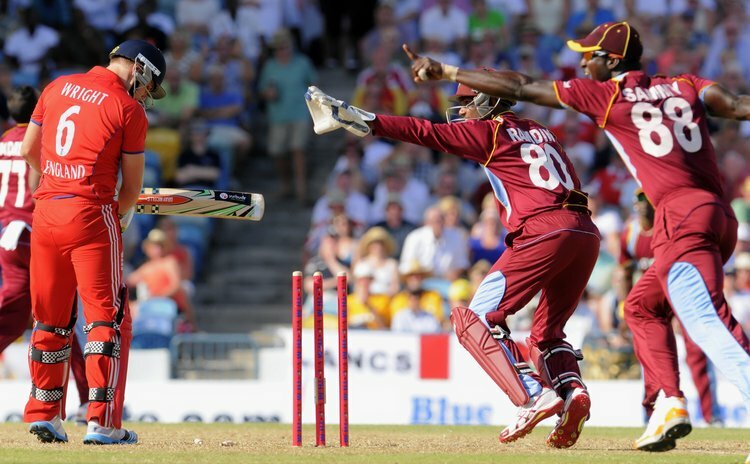 West Indies Innings: 170/3 (20 Overs). Marlon Samuels 69, Chris Gayle 43, Dwayne Smith 27, Andre Rusell 24*; Ravi Bopara 4-0-23-2, James Tredwell 4-0-16-1, Jade Dernbach 4-0-36-0, Tim Bresnan 4-0-36-0. England Innings: 143/9 (20 Overs). Tim Bresnan 47*, Ravi Bopara 42, Eoin Morgan 19, Michael Lumb 18; Samuel Badree 4-0-17-3, Marlon Samuels 4-0-21-2, Sunil Narine 2-0-8-1, Dwayne Bravo 4-0-30-1. Fall of Wickets: 1-57 (Smith, 6.2 ov), 2-87 (Gayle, 11.3 ov), 3-112 (Simmons, 14.2 ov). England Bowling: S Broad 2-0-26-0, J Dernbach 4-0-36-0, T Bresnan 4-0-36-0, B Stokes 2-0-30-0, R Bopara 4-0-23-2, J Tredwell 4-0-16-1. West Indies Bowling: S Badree 4-0-17-3, R Rampaul 3-0-31-0, S Narine 2-0-8-1, DM Bravo 4-0-30-1, M Samuels 4-0-21-2, D Sammy 1-0-12-0, A Russell 2-0-21-0.